Is there anything better than a free game? OK, yes, of course there is--I just thought of a bunch of examples, in fact, some of which could be shared here and some of which couldn't. When it comes to the hobby sometimes known as gaming, though, can you think of anything better than obtaining a piece of software for the lower-than-low price of nothing? Granted, acquiring a bad game for free isn't as exciting as acquiring a good one for the same price (or lack thereof), but I think even that can be pretty cool. 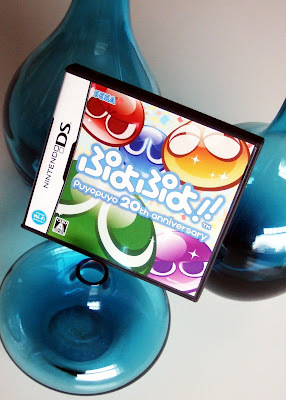 I bring all of this up because I recently got my greedy hands on a free copy of the DS version of Puyo Puyo!! 20th Anniversary (it's also been released--in Japan--for the 3DS, PSP and Wii) thanks to my blogging and podcasting pal, Anne Lee (aka apricotsushi). Because all of my attention is focused on completing, or getting as close as possible to the end credits of, Chulip, I have yet to spend any time with ol' Puyo Puyo. I promise to give it some time in my DS (or maybe 3DS) soon, though, and after I do that I'll force myself to sit down at my computer and hammer out a blog post about my initial impressions of it. I couldn't help but place the game at the center of those vases when I went to take the photo a few days ago, Anne. They'd also work well as the base for a Dragon Quest game, don't you think? Or, even better, one of those awesome slime 3DSes that were released in Japan. Anyway, thanks again for the game. What an awesome prize! Can't wait to finally play it. She's wonderful. And I'd agree with Anne about the vases. Perfect. Just don't get them too close to one another or they may form a chain and disappear...or worse, transform into a King Slime. But then you have to fight it! Who says I can't tame it and make it a pet? ?